Has an angel appeared before your eyes or made its presence known to you in some other way? Here is a collection of stories shared by people who have had angel sightings, angel experiences, dreams, and memories. Some of these amazing stories may make a skeptical person think twice. I was giving a new client a reiki treatment. My hands were focused on her body as were my eyes. I felt a presence in the room. When I lifted up my head I saw an angel step through the wall into the room. He was so very tall that he had to stoop so as not to bump his head on the ceiling. My first thought was this must be the Archangel Michael because I had been told once that the archangels are tall. I don't know why I thought it was Michael, I was just sure it was. My baby was in the hospital having a 4-hour surgery. My estranged husband was not present. At this time, our marriage was crumbling. But even worse, I was afraid for my baby's life. When I arrived in the waiting room an older lady was sitting there working on a quilt with words from the "Serenity Prayer" on it. It said, "God, grant me the serenity to accept the things I cannot change, courage to change the things I can, and wisdom to know the difference." In my home, we are not religious by any means. One night I was putting my son to bed and he started telling me that the night before, Jesus brought an angel to him because he was scared. He said, "She was so beautiful and her wings were so big they almost touched my walls." He said she sang to him and laid with him until he fell asleep. He then said Jesus came back to get her, and he brought her back to a door with him where they started to sparkle and then went through the door. Ever since my son has been obsessed with Jesus and angels. He prays to an angel often and prays for Jesus to come back. My 15-year-old grandson and I were putting up garage sale signs several blocks down the street. When I got back in the car to head back home I looked at Dawson, my grandson, he was looking out straight ahead and asked if he could stay the night. No sooner than he asked the question, while driving, in a flash of an eye, I saw huge white angel wings encompass my windshield. At that very second, Dawson shouted, "Grandma, did you see that"? I said,"Yes, I saw huge angel wings covering my windshield." He said, "No, Grandma, I saw a ball of fire." I’ve never told this story. When I was about 7 years old, I was left at home alone with my nephew who was 3 at the time. We were playing in a back room when something scared us. I don’t remember what I saw or heard, but I knew I had to get out of that house or we were going to die. I clutched my nephew tightly, both of us screaming and crying, and ran toward the front door. Just before reaching the exit, I saw a tiny ball of glowing white light hovering just above our front door. I stopped dead in my tracks. I could not take my eyes off that ball. Suddenly it started getting bigger and bigger. Eventually, we were totally engulfed by the light. I have believed in angels all my life. In my younger years, I lived an exciting life, threw caution to the wind, and put myself in dangerous situations. I used to think I had worked my angels overtime. Last year was the worse of my life. In six months, I lost my brother-in-law, my younger brother passed away, I had my adult son and family removed from my house, and I divorced my absent husband. I've never experienced anything like this but it was amazing. Every night I will say a prayer, "Now I lay me down to sleep, I pray the Lord my soul to keep, guard me Jesus through the night and wake me with the morning light. " It started with me seeing a figure at the end of my bed. I also kept seeing purple, green, and white balls of light in my room at night. One night, I had just laid down. Suddenly, I was outside staring at this woman who had long black hair. Her wings covered the whole of the sky. She was massive. I asked her what she wanted, shouting at her. She smiled, and she told me she was the angel of the morning sun. She flapped her wings three times and my body went all funny. I was back in my room. I could see myself lying in bed, I was on my ceiling. I was 4 years old. I was in my brother's room, crying. This is when I heard a sweet voice called me. I looked up towards the footboard and saw a woman with long hair lying on her right shoulder. She had on a white flowing cloth with light blue trimming surrounded by a white mist. Her arms were extended out with her palms facing upward as if she wanted to embrace me. I prayed that God would show me an angel, and he did, twice, many years after I prayed for this. Both encounters happened when I was sleeping. I suppose angels will come to visit us on occasion when we would be most relaxed and receptive to their visitations. The first encounter I had, I was in a dream state walking along a dark path at night. Then suddenly, the entire environment setting lit up with incredibly pure bright light as if the sun itself was shining on me. When I was younger, I was going through a lot of things that a young, 16-year-old girl shouldn't have to endure; You can try to imagine. My mother and I were arguing a lot. She was very angry because she was going through things of her on. She took it out on my little brother and me. Not long ago, my father was diagnosed with stage 4 bladder cancer and was not given much hope for survival past the Christmas season. Although the odds were devastatingly against him, he chose to go through a round of chemo to take some comfort in the idea that he tried everything he could to be cured. Although God had other plans, I take comfort in my faith that he will be taken care of by Christ and the angels themselves. In 1974, while stationed in Pearl Harbor, someone I had been drinking with spiked my wine with LSD. He did so with several others. We all went back to the base barracks, and some of the guys were going crazy. I prayed for help. A sailor opened his door and asked what was wrong. I told him. He asked me to get everyone and bring them to his room. I did. He asked if we believed in God. We all shared our experiences about God, and that is when I noticed I was sober. It was way too soon for the LSD to wear off, it can be an 18-hour experience. It had only been a few hours since our drinks had been spiked. Moonville, Ohio, is an old town that was overtaken by a plague, almost everyone died. All that is left of the town is a tunnel. We went through the tunnel, and three of my grandsons climbed the hill to the top. There was a thin beam of light that looked like a sword. It was right in front of us. I couldn't see when I looked up to take the picture, the light was so bright. I took the picture anyway. I had a difficult two years full of losses, sadness, and major changes. I was recently diagnosed with depression. I had some very strange experiences and some moments of pure bliss. My son called me because he wanted to die, but after trying to convince him that I should fly there to help with the children he hung up. My 7-year-old grandson called me crying and said, "Please, Grandma, come!" I called the airlines and had to be at the airport for the last 9 p.m. commuter plane. The terminal was under construction so I was left at a shuttle site in the parking lot in the pouring rain. It was 8:45 p.m. I had never used this airport so I was terrified and began crying. A woman appeared from the black of night and said, "Why are you crying?" I replied, "I don't know where to board the plane!" At 18, I was in a car wreck. Out of nowhere, a lady in white clothes like a nurse appeared. She held a towel to my head stopping my severe bleeding as the firetrucks were coming. She said, "You will be fine now." I looked away and she was gone. I asked the fireman where was the lady. He said, "What lady?" I pointed to where she had come from, and he said she could not have come from that area. That was a 500-foot cliff to the Pacific Ocean. It was May 2011, I was not feeling well. Everything seemed to be falling apart. I would spent a lot of time on Facebook and internet. I felt I was challenged by evil spirits. I was feeling like I was dead most of the time. I would see my spirit get out of my body and wondered if my dad would come in a spirit form to bring my soul back to my body. I know I needed healing. I wanted help with my emotions and felt I needed them to flow instead of wearing a protective mask or being like a statue. I have several angels and see them each in different ways. My father is rainbows, my grandma is butterflies. There are orbs in pictures. I know they are there when I photograph them. They are red and often in shapes of angels. I have been told I have five. We were in the jungle at Taljai Devi near Pune (India), we knew we were lost. Both of us had almost decided that might have to spend the rest of the night at the jungle, but suddenly from somewhere, a man appeared. His looks were serene in spite of meeting him at that time of day in a jungle. We did not get scared of him at all. He looked so peaceful, there was such serenity on his face. We followed him. Me and my friend both knew that he is either an angel or a man sent by an angel to help us. When I was taking pictures in my backyard one and a half years ago, I looked to see how the photos appeared. I found that a great, awesome cloud came down my alley and three UFOs shaped like pyramids were in my backyard. Three men wearing silver suits and silver cone-shaped hats advanced from the UFOs toward me. I have a daughter who is permanently disabled. She had open heart surgery when she was only 3 months old. We were told when she was being prepped for surgery that we shouldn't do it and that her prognosis wasn't good. They said that they would make her as comfortable as possible until she passed. Yesterday, I just asked no one really, "Please, just give me a sign on what to do (I want to relocate from Ireland to Spain but was not sure if I should go for it or not )." The next day, I was looking through one of my many handbags, and I put my hand in to grab some coins out of it. Suddenly, I found myself with a silver ring in my hand with a coin stuck in the middle of the ring. At the age of 15 years old, I was riding my four-wheeler. I tried to climb a hill with my four wheeler by myself, risky since no one was there if I had wrecked it. I have been living a reckless life for quite some time. I have put myself in situations that most people would not have survived. As my life became more reckless and dangerous, my family told me "Something has to be watching you or protecting you." I had started to lose my faith, until one night my mother came to my bedroom and told me, "Please change. Death is following you. I have never seen someone go through so much and live. Please change." During a very rough time last week, my daughter and I went to the mall. At the bottom of the escalator a lady approached us and started a conversation. She asked me a lot about where I was from, etc. Then. she told me that this rough time would pass, and that the girls at school were jealous of my daughter, and that she just needs to hold her head up high and not respond. Wow! How did she know there was a showdown at her school the day before? She also said that my daughter will have her pick of colleges to choose from. (She is a straight-A student since kindergarten and is now in 10th grade.) She also looked deep into my eyes and told me that she knew I had been to hell and back but this will all make me stronger. I was the manager of a radio broadcast station. I worked the morning show in which I had to wake every morning at 3 a.m. to get all my prep together by 5 a.m., which was airtime. The night before, I abruptly woke up at 11:00 pm. I had been sound asleep by 9:30 p.m., yet felt I had to call the radio station urgently. I was initially disoriented, yet driven. I was barking orders to my equally-sound-asleep husband who responded beautifully to my orders. I asked my husband to get on the cell phone and get ready to call 911. The other night I came to stay for the Christmas holidays with my dad and brother. My brother sometimes is a person I still don't get along with even though we are adults. He keeps to himself and seems to ignore me most of the time. I feel very sad about this every time I visit my family. He is not nice to my mom at all who lives separate from him and my dad. I was taking my 3-year-old daughter to daycare. I had left the house and traveled two blocks when I came to a major intersection that was being widened. I was the first car at the light, my daughter was in her child seat in the front. The light turned green, as I readied to go through the intersection, loud and clear, I heard the words, "Don't Go." It was so clear that I thought someone was in my backseat. Years ago, I was out with my two good friends and we were walking around in this big shopping center. Over an hour, we hung around the perfume section looking for the right smell, so in the end, we were quite dazed. I was in a bad place in my life. I was having terrible problems with my 22-year-old son. I was literally at the end of my rope. One night on my way home I was alone in the car, and I starting praying out loud. "Dear God, please send someone to help me. Let me see angels as a sign. A sign that things will get better. I'm so lost and in such despair. Please send me an angel to help me." One Wednesday night back in the late 1990's, I decided to sing for God under the evening stars. We live in a semi-rural area, so thankfully I wouldn't be waking anyone up. I suggested to God that He may want to have some angels doctor up my lame singing voice as I'm sure He is used to hearing beautiful angel choirs in the heavenly realms! I believe in angels because I have lots of experiences wherein I know they talk to me. Angels don't only watch and guide they also make you a better person. I was in a bad situation two years ago. I was angry with myself, but I never noticed it. In my dream, there were two men standing on a platform. They called me. I noticed three gray stones in their forehead. I don't know why they had that. One guy asked me, "Why are you angry with yourself, what is bothering you, why are you punishing yourself," he said. You have everything. You have a nice family, house, people love you, then why don't you love yourself?" His tone was an annoyed tone, I cannot answer because I know he is correct. I just said, "I am terribly sorry," and I cried. 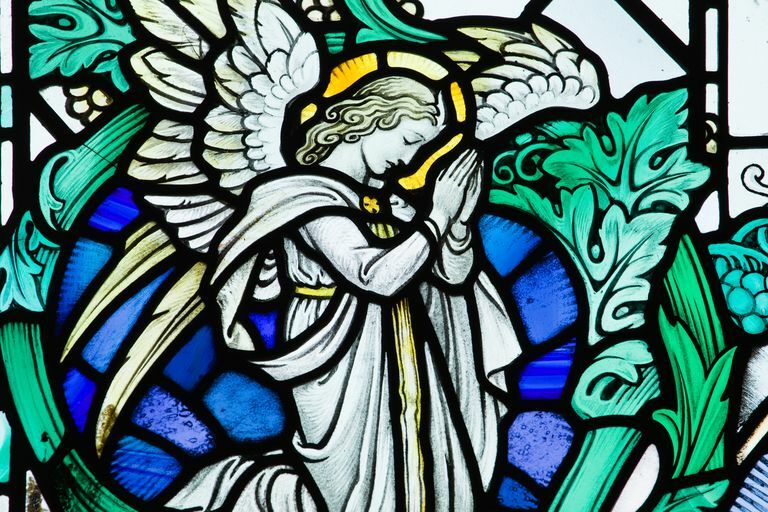 I was raised Catholic, my mom incorporated angels into our everyday life like to reassure us. For example, thunder is just the angels bowling, and lightning is the angels taking pictures (that one led to a bit of danger as we all wanted to run outside and smile at the heavens during a lightning storm). As an adult, I left the Catholic Church and the saints and angels to explore other spiritual paths. So I was quite surprised when in my mid-40s, Raphael and Uriel came to me. I'd worked as an intuitive healer for years. When the angels came I was so surprised. I said, "I don't work with angels." Uriel responded, "Nevertheless, we are here." When I was leaving the grocery store, there was a sweet old lady and she seemed like she had appeared next to me. I was laughing, and when I glanced over at her she had a warm smile on her face. I couldn't help but smile, too. When we were standing outside of the store, she had mumbled, "Now where did I park that car?" Then my mother said, "That makes two of us." I believe that I saw several angels on several occasions. The first sighting was at a devastating fire in West Philadelphia of a church that once was affiliated with the People's Emergency Center. The building was gutted and there appeared to be about two or three pacing back and forth. Second, two enormous ones, both young, white rather Raphaelite-styled males, about five building-stories high appeared to be standing on either side of Market Street about one block south of City Hall in 2001. I had just done the reiki. At night I could not sleep. Around midnight, I felt that I was floating, though I was still in bed. When I opened my eyes, I saw the whole room was filled with white shadows, but I was not scared, and I tried to make out what they were. Driving home from work going through a neighborhood, I saw a homeless man pushing a grocery cart filled with odds and ends. I suddenly felt the need to stop and give him money which was something I did not believe was a good idea. I felt compelled to do just that. He said that he had no shelter to go to but that God always took care of him. I gave him the money and he blessed me. I turned a corner and felt compelled to go back again. He had disappeared into thin air. He was there in the middle of the street, in the middle of a subdivision, in the middle of a block, and then he was gone—shopping cart and all. The accident happened around 1979. My girlfriend Donna was driving the car on the Bronx Expressway one evening with another friend and me. We were in the left lane when the car decided to stall. Normally, you would glide over but Donna hit her brake. That is all I remember until someone called my name "Veronica, wake up." I was in the back seat and we were hit from behind. The person pulled me out of the car. I believe in angels and my mom was one of them. Shortly before she died, she began preparing an amazing "shindig." She wanted to look nice, have great food, and enjoy and celebrate her life. Two days later, she unexpectedly died. Don't tell me she didn't converse with the angels. Don't tell me she wasn't planning her entry into the hereafter with the angels and saints and our God. She had never ever been so happy in our life and she told me so. She brushed off all the materialistic things of this world, told me to get rid of her house, a house she had clung to with tenacity for years. My two dearest friends of 50 years were each killed in similar head-on collisions 17 months apart, and each occurred two days after the birth of my daughter's children, which convinces me that the timeliness of these two accidents was predetermined so that each baby could have a very special guardian angel. I had a surgery a year ago. One night, I was reading a book about how to communicate with your guardian angel, then I fell asleep. An old boyfriend broke my heart by leaving one day without explanation. Years later, I received a phone call from his mother, he was dying of brain cancer. She felt seeing me would bring comfort to him. This was a very emotional situation I found myself in. I decided to visit him and ended up being committed to him in a nurturing way for the rest of his life, which ended up being a year. This time was an emotional roller coaster, and I often felt confused. One day while going to the train station, an old woman dressed in black stopped right in front of me and said, "God loves you, you are doing the right thing," and she walked away.